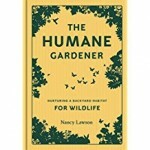 For centuries mankind has thought of the natural environment as something to conquer and control but that is changing and Nancy Lawson’s book, The Humane Gardener, is an eloquent voice for that change. Lawson gives convincing arguments for learning how to live in harmony with nature and presents ways to do so. Drawing from the experience of gardeners across the country as well as from information from scientists and horticulturalists, Lawson shows how a partnership with plants and animals can work to enrich both the landscape and our own spirit. Lawson’s approach to mutually beneficial coexistence with wildlife treats subjects such as letting nature decide what lives in the garden, using of indigenous species to provide food and shelter for animals, giving up the use of poisons, learning to appreciate species often considered undesirable, and embracing the forces of nature that drive the ecosystem. Both the anecdotes she relates about her own experience and the case studies she provides give the text a very personal touch. Her message is made more poignant by the way she describes the benefits of her suggestions with attention to detail and sensitivity for all wildlife. Her great love for plants and creatures large and small come out on every page and is heightened by the numerous small pictures throughout the book. A heartwarming read for anyone interested in wildlife and learning how to appreciate and enjoy living in harmony with it. To buy The Humane Gardener from Amazon.com Click Here.